Let's ally with their struggle, again, and wish them success! Student protesters battled with riot police inside the Quebec Hilton hotel yesterday, trying to get into a forum about increasing tuition fees that another group of students had just left in protest. The attempted disruption came minutes after student and union representatives walked out of the forum, called to seek the views of about 120 people in Quebec's university milieu about the issue of tuition hikes. "We walked out because the meeting today was fixed," said Louis-Philippe Savoie, president of the Federation etudiante universitaire du Quebec. I don't understand the logic behind this - if hydro rates increase, wouldn't the wealthy also have to pay more? And why penalize the working poor and retired? It's exactly the same neoliberal thesis about raising tuition fees. In the case of hydro, the "Lucides" proposed raising hydro rates and using the profits to pay off the national debt! In other words, take from the poor and give to the rich. The other side of this coin: Provincial governments will continue to have the freedom to make lucrative deals for (e.g.) aluminum companies which need cheap hydro to refine bauxite. Again, the poor and workers pay, the rich benefit. Apparently 10 youth were arrested - don't know why, didn't see it. Great demo, great weather, great spirit! Is the PQ preparing to betray the student movement on tuition fees? PQ finance critic Nicolas Marceau said his party supports indexation of tuition and other fees. This is an about-face from the 2008 program, which clearly called for continuing the freeze. The story points out that PQ elected members were among the 50,000 demonstrators on Saturday. Maybe we should have been listening more carefully as they chanted the slogans. The PQ's position will be debated at its convention in April, where a rather ambiguous document sets out the party's thinking on accessibility and affordability. Student leaders have already warned that if Marceau reflected the party's stand, then the PQ can expect to be treated no differently than Charest's Liberals by the movement. Yes I use electric heat, but also have a wood furnace. I usually spend $500 - $600/year for wood, but now have enough to last probably three years stockpiled. Actually, no. This has been a very cold winter - although not much snow - and I've burned through a huge supply of stockpiled wood, I just have enough for next winter now. Next winter I'll have to get another supply of firewood for the following winter - and the price has gone up due to the cost of gas and oil for our snowmobiles. Amazingly, one liter of oil is almost $10.00 for a two-stroke skidoo! Can I assume the PQ, if elected next time, will drop the health tax or surcharge? Thanks for that, U. 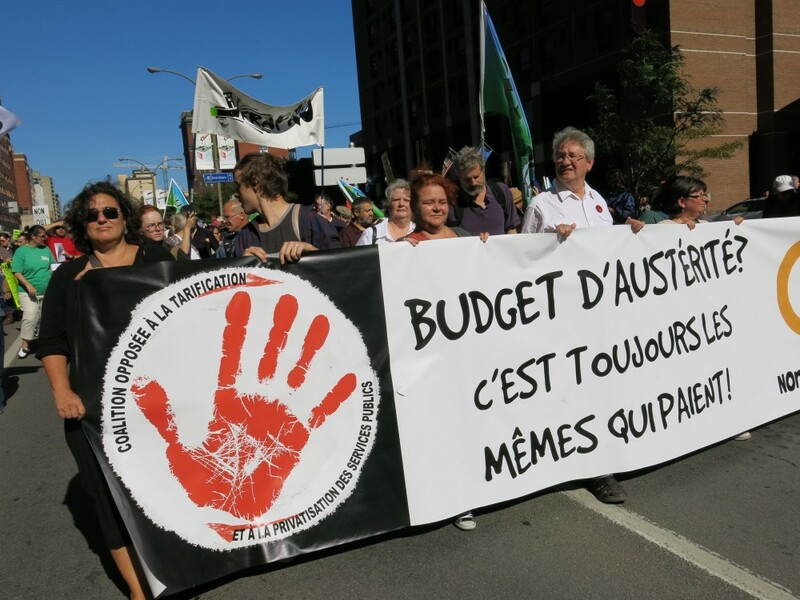 My memory is really foggy this morning (I have a cold, migraine, and my arthritis is sore all over), so could you (or anyone) chime in on whether a PQ budget would be more generally kinder overall to low income people in Quebec than the Charest Liberals are? Post-secondary education is affirmed by the United Declaration of Human Rights. It is a public good in and of itself. As such, we should be fighting to move towards a public funding model, not away from it--indeed, the students of Quebec know this and that is why they enjoy the lowest tuition in the country and the best funding system. "Tuition has to go up" is the mendacious refrain of corporatized University presidents, not of students or of citizens in a democracy. Believe it: the students of Quebec will not take this budget sitting down. And I love this thread, not least of all because it is of renewed significance today - and I miss Boom Boom. Contrary to popular myth...The PQ are further right than the Charest Liberals. Anything to back that affirmation? Oh, they made several propositions I don't agree with, especially in the quest for zero deficits, but we're talking about the Liberals doubling tuition fees, imposing a regressive tax (la taxe-santé) to pay for cuts in progressive taxes, increasing the costs of services across the board, which affect the poorest the most, etc. Yeah, although I share your view of the (especially post-Parizeau) neoliberal PQ wannabes, I'm not sure what "further right" could possibly mean in this context. And Matthieu, I'm sure, hasn't forgotten that the PQ, while doing what it had to do after the students and their allies overthrew Charest (cancelling his big tuition increases), poked the students in the eye by instituting "cost of living" increases instead. Not "further right", but a betrayal nonetheless. And after pretending to oppose Charest's taxe-santé... well... they broke that promise, didn't they? So I think I agree with both of you lol! The myth being anglo and ROC belief that the PQ are somehow 'left wing' and/or 'socialist'...They are neither. The PQ are not progressives---far from it. The Liberals have attacked people on social assistance several times - are there some short memories here? Not defending the PQ, but they are certainly not to the right of the Libs. They never lied to the students: their proposal was always to have a cost of living adjustment to tuition fees. And notice the lack of manifestations since: a large swath of the population and of students, including many that were on the street, find it quite acceptable. While you may argue that free tuition can be the best way forward (as I do), the fact is that, during a period of austerity, it was never going to happen. Though they are no longer the left-wing party they were back in Lévesque's time, they are still a center-left wing party, which is better than any party that has been in power in Ottawa since the sixties can say. I'll grant you the cut to welfare was both wrong and a really stupid thing to do. It's probably the worst thing they've done. They have manage to end nuclear power in Québec (I support it in general, but it was not needed in Québec). Their infrastucture policy is centered on electification of transports. They've managed to pass a mining bill that, while diluted due to being in a minority government, is better than the liberals would have done. They are also passing a bill on end-of-life rights (which half of the liberals oppose). Of course, if you can't accept to compromise ideals in the name of pragmatism, do vote for QS. I prefer changes I can get to ideals that will never happen. On the same note, if Mulcair's NDP ever take power, I can guarantee one thing: you will be disappointed when they have to make compromises. The conventional wisdom is that a government doesn’t dare call a general election without having presented a budget for the year. If it does, it exposes itself to accusations by the opposition parties that it is afraid to reveal the state of the public finances. It’s been 44 years since a Quebec government called an election without a budget. By doing so, Jean-Jacques Bertrand’s Union Nationale government put itself on the defensive from the start of the campaign for the April 1970 election. After a couple of weeks, the UN finance minister called a news conference at Montreal’s Windsor Hotel to present a “budget” with so little credibility that the Quebec finance department doesn’t count it as one. The UN never recovered, and lost the election to the Liberals. That taught the parties a lesson. So, when early-spring elections were called in 1981, 2003 and 2007, the governments made sure to present budgets a day or two before. If Marois called an election without a budget, she would immediately put the PQ on the defensive, as Bertrand did his party in 1970. Did the PQ eliminate that Liberal taxe-santé - or did they break their promise and keep it? Let's agree on facts. They never lied to the students: their proposal was always to have a cost of living adjustment to tuition fees. Who said the PQ lied to the students? I said they betrayed the students. Did you notice any student association saying, "Sure, fine, cost of living adjustment is acceptable"? If yes, please tell me which association and provide me with a reference. And notice the lack of manifestations since: a large swath of the population and of students, including many that were on the street, find it quite acceptable. While you may argue that free tuition can be the best way forward (as I do), the fact is that, during a period of austerity, it was never going to happen. I agree with you that the Liberals were and are worse than the PQ. But did you hear someone here praise the Liberals? I don't think so. Of course, if you can't accept to compromise ideals in the name of pragmatism, do vote for QS. I prefer changes I can get to ideals that will never happen. On the same note, if Mulcair's NDP ever take power, I can guarantee one thing: you will be disappointed when they have to make compromises. I was writing in reply to Smithee, he has said "lied to students". Of course the student associations were not pleased: their positions went from tuition freeze to free tuition. They do not have to compromise or to publicly accept the deal, since they are not unions negociating their work contract. And where was the betrayal? The fact that two groups oppose something does not mean that they both have to have their way. If the FEUQ and FECQ's position for tuition freeze had been implemented, would it still be a betrayal because of the ASSÉ's position of free tuition was not? Ah ok, I misunderstood. Yes, I don't think they lied. They said they would repeal Bill 78 (which they immediately did) and they would cancel the Liberal tuition fee hikes, which they did. Of course the student associations were not pleased: their positions went from tuition freeze to free tuition. Please. The student movement has stood for free tuition since the 1960s, as an ultimate goal. And where was the betrayal? The fact that two groups oppose something does not mean that they both have to have their way. If the FEUQ and FECQ's position for tuition freeze had been implemented, would it still be a betrayal because of the ASSÉ's position of free tuition was not? No, of course not. It would still be a betrayal because the universal demand of the student uprising was a freeze. Not an "almost" freeze. Not a "freeze" in "real dollars based on 2011". A freeze. That's why everyone condemned the PQ's cost-of-living increases, even though everyone knew that the PQ had indeed pushed that view for some time before the strike. Yes, so the student associations' demand was for a freeze (I wouldn't qualify it as universal, since a large portion of the opposition just found the hikes too extreme), but we are talking about negociations. This was not an "all or nothing" deal and the fact that they did not get everything they asked for in no way implies that they were "betrayed". Had the PQ promised a freeze and not deliver it, that would be a betrayal and a lie, but a partial victory is not a betrayal. The crystal ball was sparkling that day! You know, Joey Smallwood doesn't get nearly enough recognition in Quebec.